I'm getting in the vacation spirit. On Sunday, I'm leaving for a week long Caribbean cruise. I cannot wait! I haven't been on vacation in 4 years. I'm definitely looking forward to the relaxation.I'll miss you guys though. You all want to come in my suitcase? No worries, I'll be having some guest posts next week. 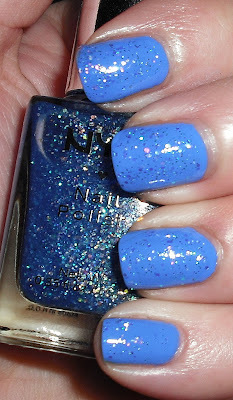 Anywho, I figured this was a nice NYX color to get in the Caribbean spirit, although I'm not going to Turks & Caicos. Oh well! Turks & Caicos is a sheer medium blue jam packed with intense iridescent glitter. This color reminds me a lot of the China Glaze specialty glitters as far as consistency. This is buildable, but it takes around 4 coats. I personally prefer this layered. I think it looks great over the blue, but I'm sure it would look great over other colors! So pretty! I love it layered! I'm getting my guest post ready for you! I hope you like! WOW. I was literally looking at this nail polish last night on cherryculture.com and wanting to see a swatch of it ^_^ -thank you !! Very cute! I like it layered! I haven't been able to find any nyx polishes. Pity because I love nyx makeup. Have fun on your vaycay! This reminds me a lot of OPI Last Friday Night!